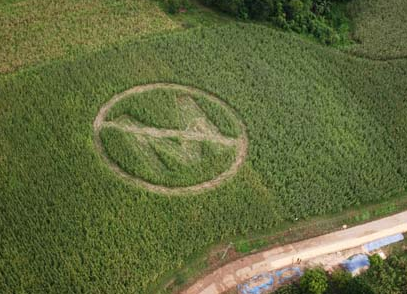 Is “GMO” a bad word? Apologies in advance, this isn’t a simple issue so I have to make a lengthier post than you’re probably used to here on Turning Veganese. Also, please don’t hesitate to ask me questions. I have trouble talking like a normal person because I spend most of my time with other eggheads so I understand if more explanation is needed. Genetically modified organisms or GMOs are often a hot topic in news reports and nutrition bulletins, and I want to give you the perspective of a scientist. A GMO is any organism whose genes have been altered in a laboratory. Genes are passed back and forth between organisms in nature often enough that there are dedicated natural mechanisms to promote and facilitate gene transfer. Scientists have harnessed these mechanisms as tools for understanding and interacting with the world around us. The intent behind each genetically engineered product is colored by the perspective of the engineer. My point is that, genetic engineering isn’t necessarily bad. 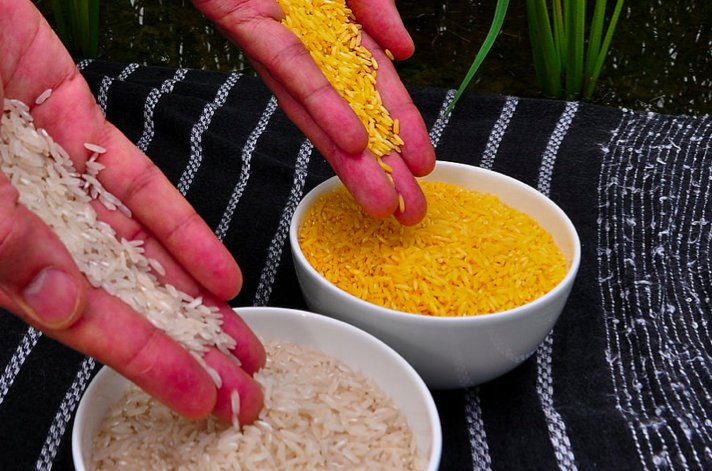 Golden rice is an example of a GMO created in 2000 as a humanitarian tool. Above is regular polished rice next to golden rice. Golden rice was engineered to contain beta caroteine which is a precursor to vitamin A. Vitamin A deficiency is the culprit for 1-2 million deaths annually, 500,000 cases of irreversible blindness and millions of cases of xeropthalmia (that means “without tear ducts”) in countries where dietary vitamin A is scarce. Golden rice has the capability to end the horrors of this tragic and preventable vitamin deficiency cheaply. Golden rice has been distributed and hybridized with local varieties to maintain genetic diversity (which I’ll talk more about shortly). Several of the researchers who developed this boon to impoverished earthlings went on to work at big agriculture and chemical corporations which takes me to a criticism of a GMO crop. Genetic use restriction technology (GURT) is a seed that will either produce sterile offspring or must be sprayed with a chemical sold by the company that created the GURT plant in order to activate the engineered properties of the plant. Many farmers, particularly in poorer countries save some of their seeds from each crop to plant next year. This means that farmers who buy this plant can’t save seeds (which also stifles diversity; don’t worry, I’m getting to it); they either have to buy more seeds from the company or buy more chemicals. I would compare it to drug dealing where seeds are methamphetamines and withdrawal is almost as disillusioning as being high. Still GURT is just one example of how GMOs can be bad, not a broad statement about genetic engineering, so I’m going to cover some of the shades of grey involved in genetic engineering. The most common and most desirable mutations are ones that allow crops to survive adverse environmental conditions like frost or drought and ones that prevent them from being susceptible to pesticides, herbicides and fungicides. It really depends on the individual gene that confers these advantages as to whether I can have an opinion on whether they’re good and bad in the context of our bodies. The next obvious issue is whether or not they’re doused with poisons. If there isn’t an alternative I would buy a GMO product that was grown organically versus a non-GMO that was grown conventionally. 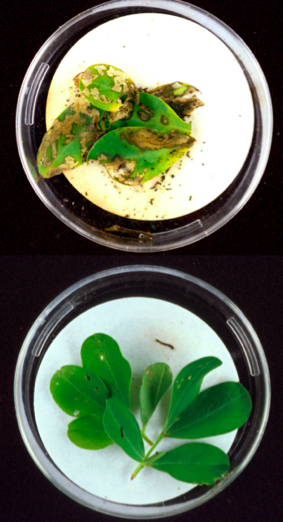 For example, the picture to the right has a wild type peanut plant (above) and an engineered peanut plant (below) grown without pesticides. The modified one appears healthy and untouched and the wild type is looking gnarly. This particular plant is producing a natural toxin from a soil microbe, Bacillus thurongensis. This particular toxin affects insects by binding to part of the insect’s gut. People just don’t have that part so it doesn’t affect humans, kind of like how antibiotics hurt bacteria but not people (though some people have allergy responses to some antibiotics). For decades the toxin itself was isolated from the bacterium and sprayed on crops. The issue was that it then washed into the water supply affecting insects other than those targeted by farmers. Putting the gene in the crop meant that only insects that fed on the crop were affected which good because fewer chemicals and less work would be needed to grow the crop but there’s also something not necessarily dangerous but also “not peanut” in it. So, yes. I might buy these GMO peanuts if they were grown organically. Still, I favor organic and non-GMO. On the other hand, there’s RoundUp Ready soybeans and other crops. These babies are engineered to be resistant to glyphosate. Glyphosate is a highly toxic chemical that’s capable of killing animals, fish, birds and pretty much anything else, including weeds (above). 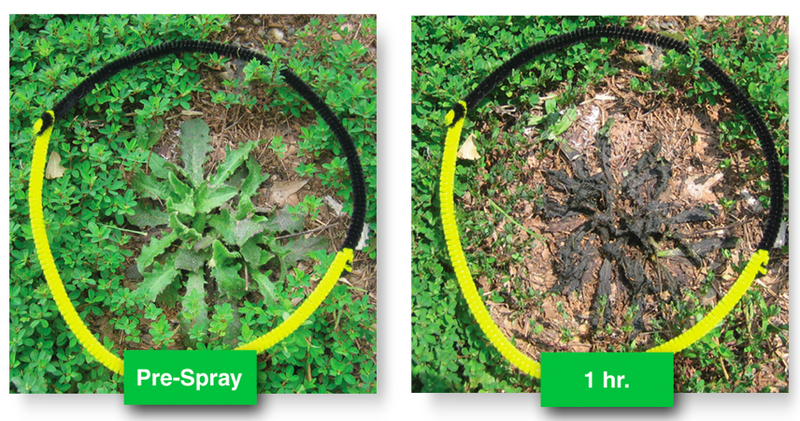 RoundUp Ready crops can be sprayed liberally with this chemical and survive. This would be great except that some of the chemical stays in the crop that eventually people eat. Even in small doses it’s known to be a teratogen (causes birth defects) and carcinogen. Still, I might buy RoundUp Ready crops that had been grown organically because it’s the pesticide that’s an issue, not the genetic modification. Nature also has a leg up on us and a dry sense of humor. Above is a map of the distribution of weeds that are now resistant to glyphosate, undermining the appeal and advantages of RoundUp Ready crops. 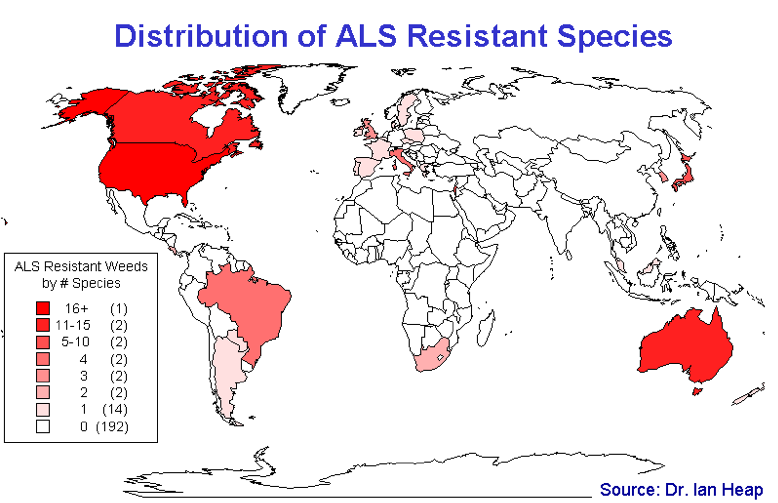 Coincidentally the reddest areas are also are the places where RoundUp Ready crops are most frequently planted. As I noted earlier, nature has mechanisms that allow the very genes we manipulated in the laboratory to be exchanged between related organisms as well as the simple elegant process of evolution in its formidable arsenal. If there’s anything I’ve learned as a scientist and farmer it’s that you can’t beat nature; you can only try to work with it. Now on to my reasons for favoring non-GMO foods. Genetic diversity is important. Often when a crop or livestock is genetically engineered, they all have identical genes. This is important because things that have identical genes have identical susceptibility to disease or adverse environmental conditions. Genetic variation is how some organisms survive while others perish. 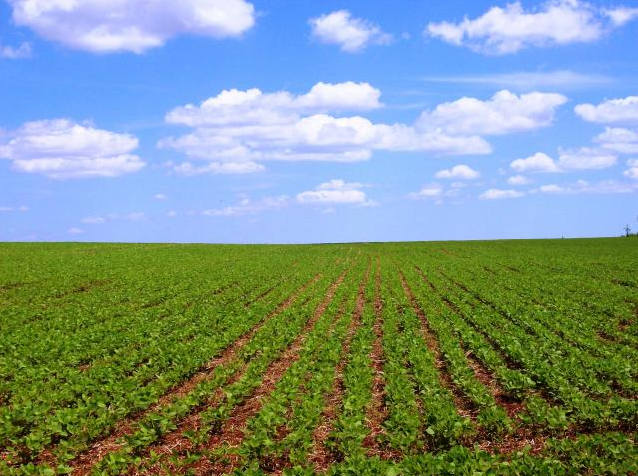 Humans often plant huge fields with the same crop. This makes fields like big cities where a common cold spreads rapidly because people are in close proximity with one another and can spread disease. Of course some people just don’t get sick. This might be genetic, chance or maybe they’re just healthier. When we engineer crops, we can take away the opportunity for plants to rely on genetic diversity to fight disease. 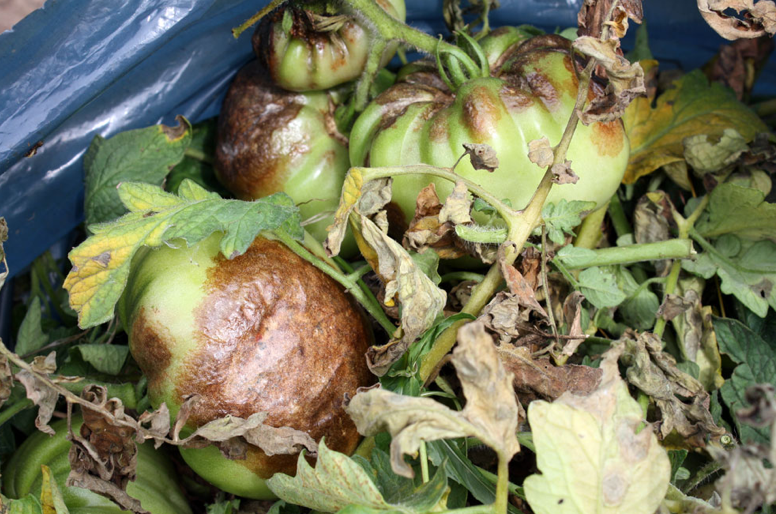 The icky looking photo [above] is an early image from the 2009 late blight that ravaged tomato and potato crops in the Northeast. I’ve never seen anything like it. I watched entire greenhouses go from emerald green leaves and bursting with beautiful plump tomatoes to steaming heaps of putrid grey mush in only 3 days. THREE DAYS! Reliance on one major crop in combination with a late blight was what caused the Irish potato famine between 1845 and 1842 and after seeing it in action, I understand why it was so devastating. If you’re not familiar with that example, consider what happens when when an entire crop of soybeans or corn or other staple is destroyed: food prices skyrocket, farmers lose their livelihoods, people starve to death. The most vulnerable people would be the most severely affected: the poor, elderly and children. This is actually my biggest reason for avoiding GMO foods: to preserve the genetic diversity that’s only possible when seeds are hybridized, harvested and saved by farmers instead of cloned by big corporations. I can’t make any other sweeping statements about abuses of the technology. So to conclude, it’s more nuanced than “GMO good” or “GMO bad”. Sorry folks, it might not be the concrete answer you wanted but hopefully you learned something. I can still offer this word of wisdom: buying organic shows reverence for the earth in it’s entirety. It made you. Recognize. very well put Christy 🙂 I think a lot of times people think of this as a black and white issue, and you nicely pointed out the grey area. Thanks for that. It’s easier when you can look at things as black and white but it seems like nothing is ever that simple. I love this, thanks for putting it out there!